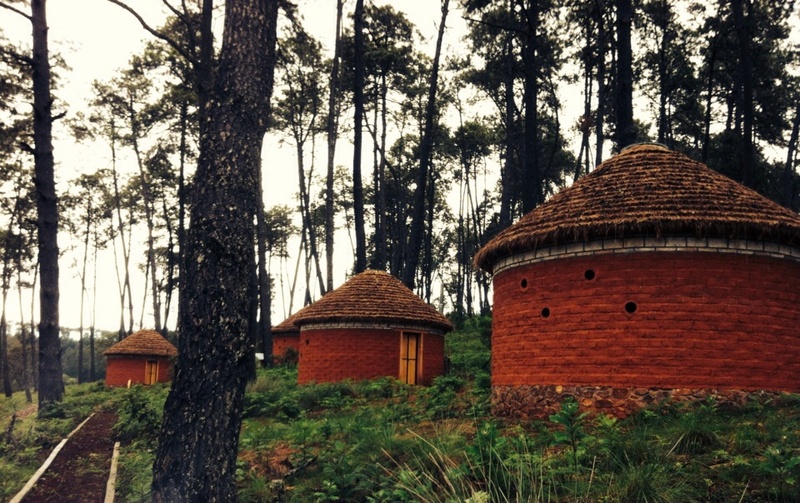 The inhabitants of Cumbre Clavellinas, in association with CDI (Comission de Desarrollo de Pueblos Indigenas) and GEPS Conservácion, requested a project to introduce in the village an ecotourism complex comprised of a few bungalows and a small refectory. Cumbre Clavellinas. a small village of about 360 inhabitants, is located on top of a mountain, approximately 2780 meters high at about an one-hour drive from Oaxaca de Juárez. The idea was to introduce a small number of cabins in the landscape and at the same time try to not to intrude in the surrounding environment. To that effort, a sustainable building approach was also procured as was a conscious take on traditional methods and materials. The cabins were built with local sourced materials. The stone foundation was made from local stone, the adobe blocks were made right there on the spot, and the wooden roof was made with wood cut from the local sustainable forest providers participating in the project. The cabins, “chozas”, are round adobe structures, that serve as a solely a resting place, enclosed and private, They interact with the exterior simply through the entrance and a round skylight that illuminates the cabin, A few round openings on the sides allow the air to circulate. This is specially important due to the existence of a small traditional clay fireplace enclosed in each one of them. They were placed along a common track that unites the refectory, the cabins, and the bathrooms. The building process was managed with the local assembly and Pedro Ramiréz Nuñez of GEPS, and the entire complex were constructed by the local people.